Here at the Kwatra Lab, we are working to find targeted therapies for patients with glioblastoma (GBM). 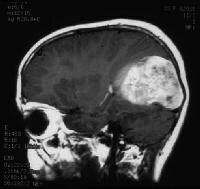 GBM is among the most aggressive and common primary brain tumors in adults. GBM patients have an extremely poor prognosis, and none of the current treatments (including surgery, radiation, and chemotherapy) have been able to extend median survival beyond fifteen months. The goal of our laboratory is to modify the current standard of care for GBM patients by replacing the chemotherapy/radiation step with targeted therapy. To develop targeted therapy, we must know the molecular pathways driving tumor growth. These pathways are likely to differ among GBM patients because GBMs are heterogeneous. Recent molecular characterization of GBMs by The Cancer Genome Atlas (TCGA) resulted in the identification of four major subtypes: classical, mesenchymal, proneural, and neural. It is likely that each subtype will be found to be heterogeneous upon additional molecular characterization. Indeed this appears to be the case. We recently characterized a panel of twenty patient-derived glioblastoma xenografts (PDGXs) according to TCGA criteria, followed by proteomic characterization of the PDGXs and their corresponding primary tumors. We also found that epidermal growth factor receptor (EGFR), which is one of the major proteins dys-regulated in GBM, is activated in seven PDGX (see our the preclinical models tab). It is our hope we can continue to use our preclinical models to find therapies for GBM patients using our strategy detailed below. Classify and Conquer. Classify GBMs into subsets that utilize a similar molecular machinery for their growth (identified using proteomics and genetic approaches) and use drugs (both known and new) to block both primary and secondary growth pathways. Please see the above graphic. 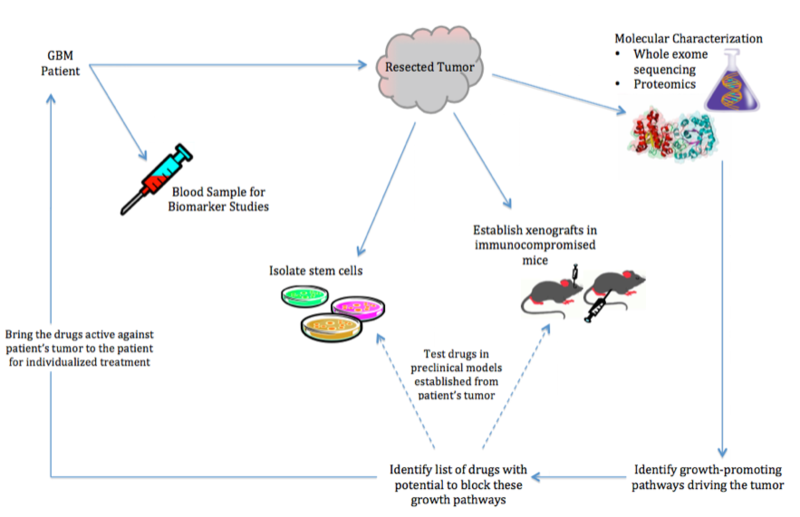 To modify the current standard of care for GBM patients to decrease tumor recurrence and increase patient survival by developing targeted therapies based on tumors’ molecular profiles. 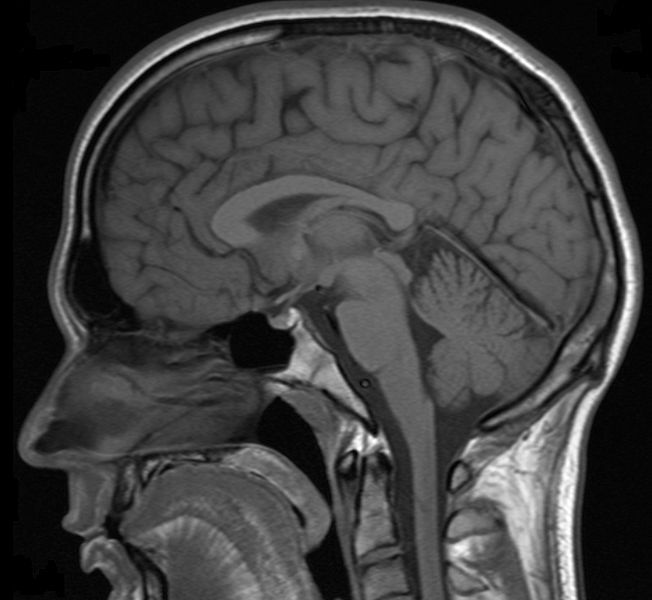 Left: Sagittal T1-weighted MRI showing normal brain. Middle left: Sagittal T1-weighted MRI showing a peripherally enhancing, centrally necrotic glioblastoma located in the frontal lobe causing significant swelling of surrounding tissue. Middle right: Sagittal T1-weighted MRI showing peripherally enhancing, centrally necrotic glioblastoma located in the temporal lobe causing mass effect on surrounding tissue. Right: Sagittal T1-weighted MRI showing an occipital lobe glioblastoma tumor in a pediatric patient.